Funko's new Legacy Collection is a line of highly articulated action figures celebrating some of pop culture's biggest franchises. The hit HBO series Game of Thrones was the first license released in the Legacy Collection, and now the series once again returns to Westeros for the second wave of characters! The second wave of the Game of Thrones Legacy Collection introduces six more of the series' most popular characters. Each 6' scale action figure features over 20 points of articulation and character-specific accessories. 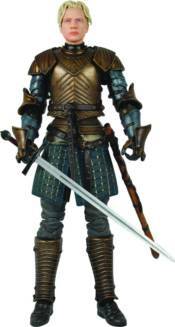 Wave 2 includes: Khal Drogo, Jamie Lannister, Brienne, Robb Stark, Arya Stark, and Daenerys Targaryen (Ver. 2).